You are here: Home » MEDIA » Films » Hotel Transylvania film review (Frank’s Take). Hotel Transylvania film review (Frank’s Take). Checking out at ‘Hotel Transylvania’ is definitely a preferable prospect as opposed to checking in. This lackluster 3D animated feature may be chuckle-worthy for the kiddies particularly when its enticing makeup is a hybrid of pop cultural reminiscences that combines ‘Twilight’ with ‘Monsters, Inc.’ As for adults, ‘Hotel Transylvania’ is just another lame excursion for funnyman Adam Sandler and his ragtag posse to assemble. Of course when Sandler and his comical cohorts come together the results are predictably disposable (anyone care to sing the praises of this year’s Sandler insufferable bomb ‘That’s My Boy?’). Director Genndy Tartakovsky, a Cartoon Network insider responsible for the series ‘Dexter’s Laboratory’ among other ditties, looks to playfully spoof the classic Hollywood monster personalities from yesteryear. Unfortunately, ‘Hotel Transylvania’ is not crafty or distinctive enough to supply any subversive laughs for the awkward slapstick it hangs its silly hat on repeatedly. Surprisingly, screenwriters Robert Smigel (‘Saturday Night Live’) and Peter Baynham (‘Borat’) conjure up a flat and flimsy screenplay that relies on recycled potty humor, stilted supernatural shtick and transparent tension. Unlike the re-released treat ‘Finding Nemo 3D’ weeks earlier, the sketchy ‘Transylvania Hotel’ feels like a forced farce that offers no genuine wit or sense of adventure. The animation looks clunky and unimaginative. The intended gag of ridiculing famous movie monsters is not very original or irreverent. The voiceover performances—particularly Sandler and his ‘That’s My Boy’ co-star Andy Samberg—grate on the nerves. This generic kiddie creep show coasts on its watered-down wackiness. 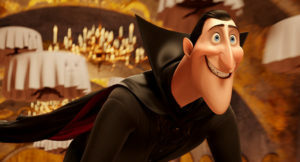 The premise involves Count Dracula (voiced by Sandler) as a worrywart single father who tries to shield his 118-year old birthday daughter Mavis (voiced by Selena Gomez) from the world of human interference. In fact, Count Dracula owns a resort where all monsters can go to relax so they can avoid any contact with the human beings they instinctively fear. Mavis, for the most part, wants to spread her wings and confront the world for which her bloodsucking Daddy Dearest holds his skepticism. It is Mavis’ birthday wish to explore the surroundings that Dracula has deprived her from experiencing. During Mavis’ birthday party at the resort, a human hiker named Jonathan (voiced by ‘SNL’ alum Andy Samberg) patrons the hotel. This presents a problem for Dracula as he toils to keep Jonathan away from his monster-minded guests. However, Dracula is not so successful in keeping his baby girl Mavis away from Jonathan as they both fall in love. The friction ensues between Dracula and Jonathan but they eventually learn to co-exist. The backstory regarding Dracula’s apprehension for human tolerance stems from the fact that an angry mob killed his wife. Thus, Dracula’s disdain is understandable but he soon realizes that Jonathan (and some humans) is not the evil entity as he had imagined previously. What a blood “sucker” this Count Dracula is for appearing in the clueless kiddie creepfest HOTEL TRANSYLVANIA! Although ‘Hotel Transylvania’ shamelessly apes the themes found in the blueprints such as the aforementioned ‘Finding Nemo 3D’, ‘Twilight’ and ‘Monsters, Inc.’, the perky proceedings are strained and the humor is about as appetizing as a Catskill comedian telling corny jokes while drowsy on cough syrup. The collection of monsters on display includes Sandler’s ‘Grown Ups’ sidekicks Kevin James (as Frankenstein) and David Spade (as the Invisible Man). Also, there is Steve Buscemi’s Wolfman, ‘SNL’ vet Jon Lovitz’s Quasimodo and Cee Lo Green’s the Mummy. Overall, ‘Hotel Transylvania’ tries to be bouncy, offbeat and kinetic but stumbles in the wake of subpar monstrous musical numbers and the gimmicky showcasing of zombie bellhops. The movie does not begin to capitalize on any horror-ridden hysteria that would challenge the kids’ imagination and curiosity much like the sophisticated effectiveness of ‘ParaNorman’ for instance. Not only is there a vacancy in the goofy-minded and pseudo-ghoulish confines of ‘Hotel Transylvania’, one can make the same claim to the continued misguided moviemaking efforts of Sandler and his cinematic sycophants. Sinister (film review) – Frank’s Take. « Doctor Who: 2012 Season One episode 5. The Angels Take Manhattan.